More Than A Festival, Lucidity is a collaboratively built “village” with a vision. Following an ongoing storyline, this year’s theme, Rising Dawn, invites attendees to “Awaken the New Story”, and create a world where humanity can thrive. As groups of attendees bring their piece of the vision to the experience, a village is built for all to enjoy over a three-day campout weekend. Stages offer a wide range of music, as well as dance, flow arts and theatrical performances. A healing arts village offers everything from massage to chiropractic to herbal remedies. Beyond the art gallery are interactive installations and immersive environments that are sure to evoke the inner child. The festival features a plethora of yoga classes, as well as workshops focused on personal growth, technology, environmental activism, creativity, and more! Also, an entire realm for families features fun activities for little people and their taller sidekicks. InnovationWorks: Building the Lighthouse; Big Art at Lucidity. Folded into a core curriculum for all students is a class on Creative Keys to Mastery, Lucid Dreaming, Chi Yoga, and Contact Improv. Rising Dawn brings with it a few changes as the narrative shifts. The New Story of Lucidity features Elemental Realms in place of the Archetypal Villages from the past 6 years. Rather than 7 Villages and a Lucid City, the New Story will showcase the 5 Elemental Realms of Water, Earth, Fire, Air, and Spirit. Interact with the characters, ask questions, and one might find there’s a deeper game to play, a more profound meaning to it all, a link between the dreamtime and this waking life that could just be the answer to the ever-burning questions in the hearts of many. Lucidity believes there is something bright and beautiful on the horizon. Find out what’s possible! Tickets are now available for this unique experiential weekend of music, art, connection and more. Learn more about Lucidity or get involved in creating the magic at 2018.LucidityFestival.com. 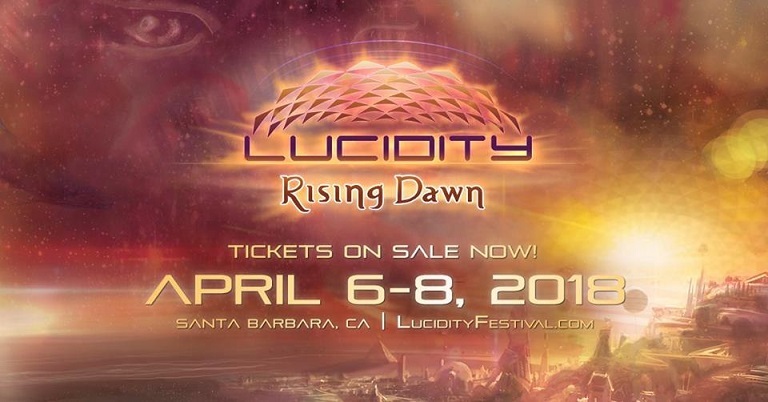 Lucidity Festival LLC is a collectively owned organization dedicated to creating transformational experiences for individuals and communities; a production company; a creative lifestyle for expanding consciousness, and an interconnected community of friends and family.